Review Fix chats with both halves of the developer Mechanical Monocle, Matt Kelso & Todd Curtis who discuss their new game “Fractured State.” Detailing the game’s creation and unique play style, Kelso and Curtis let us know what makes the game special. Review Fix: When or how did you decide to create “Fractured State”? Matt Kelso: I “cut my teeth” so to speak making mods for the old Command and Conquer games (Tiberian Sun, Red Alert 2) and then later SAGE engine games like Generals and the Battle for Middle-Earth series. Particularly in the days of Tib Sun and RA2 we had zero support from EA in regards to modding. This wasn’t an unusual stance, given the time, as we were still a few years away from Team Fortress et al and it seemed like the only noteworthy developer that was mod-friendly was id Software. 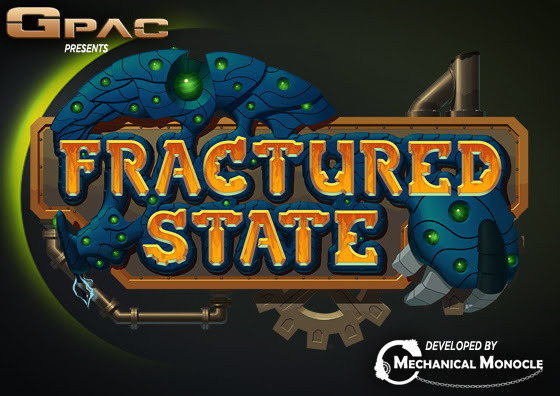 The initial idea for Fractured State – way back in the tail end of 2011 – was to create an RTS that was as mod-friendly as possible. Todd Curtis: Matt pitched the rough idea to me…four years ago I think. I have always loved RTS games and felt like we could build out a world that would be interesting. There were a lot of kitchen table discussions with Matt’s wife occasionally giving us concerned looks. We talked about destroying cities a lot. Review Fix: What games inspired this one? Kelso: Fractured State was originally designed to more or less be a Command and Conquer Generals clone in terms of aesthetic, gameplay, and functionality; the key difference being certain implementation points that I remembered being troublesome for content creators. We’ve certainly evolved a great deal since then and the Generals comparison doesn’t even hold water at this point (which is a good thing!). I think we still draw a great deal of inspiration from the older Command and Conquer games in that there is a sense of urgency and underlying darkness to the world lore but we try to punctuate that with some moments of levity – which I think those games did incredibly well. Curtis: The most direct inspirations, at least for me, probably came from the Command & Conquer series and the Dawn of War games. We have played so many classic RTS games though that I am sure bits of Age of Empires, Starcraft, etc. have influenced our decisions. Visually I would say I took a lot of inspiration from games like Bastion and Torchlight. They employ saturated colors (more so Bastion on this count) and clean, crisp graphics. Review Fix: What has development been like? Kelso: It’s been a fascinating journey. The game isn’t anything like we originally drew up during our first design discussions. This meant throwing away a lot of good development work that had been done but it was absolutely worth it to come out with a better game on the other end. I know for me – and I’m sure for Todd as well – the lessons learned over the past few years have immeasurable value. It’s also been an interesting challenge – given how long we’ve been in development – to adapt to changes in the Unity engine’s code base and feature set throughout the years. Sometimes it sort of feels like shifting sands under your feet but you eventually end up back on solid footing and the improvements are palpable. Review Fix: With all the competition on the market and with the growing number of indies now, how difficult was it for you guys to try and make something that stood out? Kelso: Quite frankly, I don’t know that this ever really occurred to us – in the sense that we weren’t designing features in a conscious attempt to stand out. None of us were really happy with the APM-centric design and/or MOBA focus that the vast majority of RTS games seem to be moving towards. And while the Total War series are astounding in their scope and technical acumen we were simply interested in trying to portray a different tone. I think Fractured State is an interesting blend of small-scale strategy that’s fast paced while simultaneously not encouraging intense, unit-level micromanagement. Curtis: My personal take on this wasn’t to focus so much on standing out, but rather on making a game I would love to play. While there is a lot to be said for incorporating different or unique mechanics, I think focusing entirely on standing out can distract you from building a solid gameplay experience. It also helps to be incredibly opinionated on what you like and don’t like in other games, and focus on tossing out the bad and improving upon the good. You just have to hope enough people agree with you I suppose. Review Fix: RTS Games have endured for so long, why? Kelso: To some degree, RTS games are just fancy, faster Chess. I think the opportunity for creating or employing interesting strategies (or just the cheesiest of strats) keeps them fresh. They are accessible but have incredibly high skills caps in most cases, which means you can constantly try to improve. That and I think most people have a little bit of the Napoleonic urge to command armies. I think certain genres lend themselves to a particular sense of timelessness due, largely, to the technical challenges that they inherently present. RTS is certainly one of those. FPS would, in my mind, be the other big (really big!) one. Ultimately, the decades of work become an iterative crawl towards what our mind’s eye wants in that genre. Doom (the old one), to me, set the bar and represents the ultimate realization of the foundation that was laid with Commander Keen, Catacomb 3D, and Wolfenstein 3D. I think much of the goal for FPS was to iterate towards a more “real” model of play. I say “real” in quotes because of course, it’s not real – but rather an attempt to elicit the same emotions we experience when we watch war movies or action movies. Call of Duty has certainly built a huge enterprise on capturing those moments and emotions but I think the new Doom shows that you can harness the craft that makes those original titles from the 80’s and 90’s so good. For so long FPS developers were laser-focused on creating those cinematic moments that I think they sometimes forgot the essence of what made the foundation of their genre really engaging in the first place. The challenge was always to depict realism – in the environments, enemy behaviors, whatever – and I wonder, with the new Doom, if maybe the pendulum doesn’t swing a bit back in the other direction with a greater focus on enemy and movement mechanics and elements that feel more….gamey. So – I think a lot of RTS games are attempting to solve the technical challenge of scale; or more specifically, how do I create a sense of grandiosity. Total War, Supreme Commander, Planetary Annihilation; these are all ridiculously good examples of how to ramp scale up to ludicrous levels. StarCraft is a weird specimen in that their cinematics seem to evoke all of the emotions and reactions that TW and SupCom are trying to create in-game and yet the design of SC itself is more akin to the Doom reboot. StarCraft continually attempts to distil unit design down to its purest components and, as a result ends up feeling smaller in scale but still satisfying to play. At the end of the day, there is a lot of handwringing about how the RTS genre is dying. Honestly, I think that’s ridiculous. There’s so much room for expression in this genre that I can’t imagine running out of places to explore or technical challenges to solve. It may be niche at this point, but it’s certainly not going anywhere. Review Fix: How is this game different from other RTS? Kelso: Our motto – once we figured out what kind of game we wanted to make – was to avoid design decisions that favored Actions-Per-Minute wherever possible. In a game like StarCraft, elite players can win battles if they can quickly micromanage the targeting and movement of their units. We have mechanics in Fractured State that actively prevent that type of advantage from occurring. We basically said that we wanted players to think more like they were playing a turn-based strategy game in real time. The pace of events is still fast, but we’ve removed a lot of things that ultimately cause players to just frantically click at stuff on the screen. Of course, there’s also the simultaneous interior/exterior combat that we’re super proud of. Honestly, it never gets old running a squad into a building and hunting down the occupying force that’s hiding in the other corner. Curtis: We decided to focus on throwing players into action right from the start, and to aid this got rid of resource collection (the only limitation on recruitment is time). Rather than build up a base in a small corner of the map, players have to choose what parts of the map they want to take over from the start. As you take more territory your population cap goes up and you may get new territories that you can recruit into. We also wanted to allow players to make use of buildings in a more dynamic way than just garrisoning them and getting some pips to represent the occupation. Interiors of buildings are accessible and must be occupied to control territory. This also means maps are true to scale, as are units. Along a similar vein, cover is a big part of Fractured State. Taking and holding positions with cover allows the player to gain a defensive advantage beyond sheer numbers. Attacking your opponents from angles that remove their cover advantage is important, which again makes map choices paramount.